The Symphony: The elements of cooking, math, and science come together like a beautiful symphony, with each section keeping tempo and harmonizing with the next. Beginning with the rhythmic staccato of chopping garlic against the cutting board, followed by the smooth rolling movement of knives slicing long cylinders of leafy greens that squeak, when very fresh. Students dangle thin ribbons of chard between excited fingers, placing them along the edge of their rulers, admiring each strand as though it was a special star before recording the longest and shortest measurement on a notepad. The grand finale erupts when a round of applause from the skillet of sizzling greens piled high like Mt. Everest, reaches its crescendo that make students, jump! “Steam.“ “Evaporation.” “It’s Shrinking,” are a few of the excited responses students shout with joy. And then softly like a distant murmur that melts into silence, an unspoken signal to all, it is time to enjoy the fruits of our labor, in the recipe, Mac N’ Greens. Silver Lining: Mac N’ Greens formerly known as, The Pasta and Greens Recipe, morphed into a little jewel, due to an unfortunate circumstance. The supermarket where I grocery shop, sold out of my pasta of choice, and as a result, I settled on elbow macaroni. When I arrived to cooking class with the macaroni, my student’s eyes poured over with excitement and they cheered in unison, “Yes, we’re making Mac N’ Cheese.” The idea stuck and I re-named it, Mac N’ Greens, a kid-friendlier version, which was an instant success. I like the ease of preparation of this recipe it’s healthy with inexpensive ingredients and tasty! Greens are a nutritional powerhouse too, mix and match for a contrast of flavors and textures, Collards, Chard, Kale, or add a little Broccoli Rabe for good measure. To make a creamier version, try some grated sharp cheddar cheese, and for a little crunch, top it with toasted breadcrumbs. Imagine a school that serves up healthy cafeteria food sourced by local farms, respects the environment, supports garden and cooking education in the classroom, and makes a positive difference in the community. The Berkeley Unified School District, a national model for school food reform, exemplifies such a commitment to its students, and understands the important role it has in promoting health, sustainable agriculture, and environmental restoration. It is no surprise that Berkeley is home to visionary chef Alice Waters, who has long championed the benefits of eating seasonally, and also helped provide a grant from her Chez Panisse Foundation, to hire Ann Cooper, aka Renegade Lunch Lady, to improve the quality of the school food, district wide several years ago. Since the overhaul to food services, some of the benefits to the schools include– universal breakfast, salad bars, cooking class recipes that link to the cafeteria, along with a take-home calendar, featuring healthy recipes that kids prepare at school. But even though there are significant changes to the school food, the heart of the programs rely on the cooking and gardening education classes that link to core subjects in the classroom, and provide students with hands-on learning opportunities about food, the environment, and nutrition. 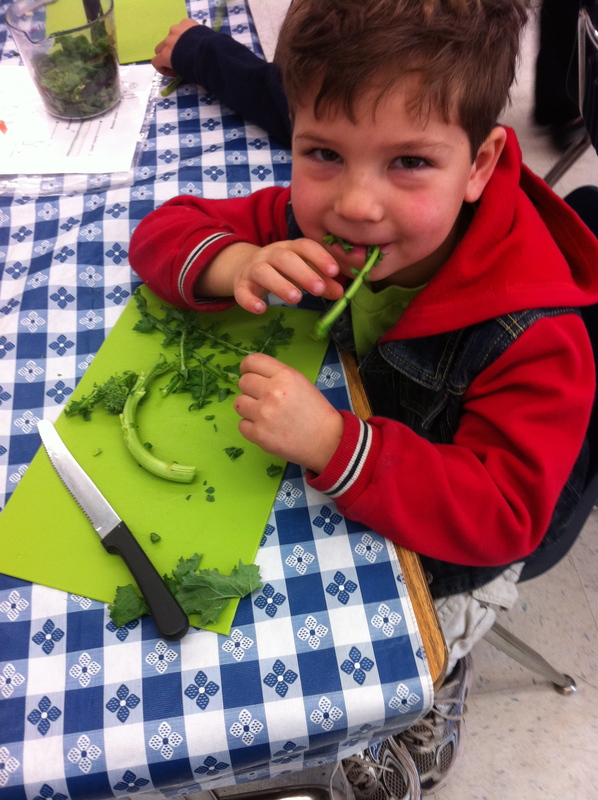 It makes a huge difference when kids are actively involved in the farm to table process, both in the cafeteria and at home– if they grow, cook, and learn about it, they will be willing to try it and discover that healthy food tastes good. To reinforce the vital link food has to our health, it is important to recognize the valuable relationship between local farms and the food we serve at school, to the way we treat our environment, and its impact on how we teach our children about food, and their health. And as a nation, we have a social responsibility to take steps to improve the health of our children, with learning opportunities that begin at school. Carrie Fehr begins her twelfth year as Chef Teacher for the cooking & gardening program in the Berkeley Unified School District. She has developed an expansive repertoire of cooking lessons that skillfully integrate core academic subjects, culinary concepts, and nutrition education. The cooking classroom is a perfect match for Carrie’s love and passion for teaching children. Her goal is to bring a positive emotional connection to healthy food and to instill an appreciation of wellbeing for every student, that will be accessible lifelong.